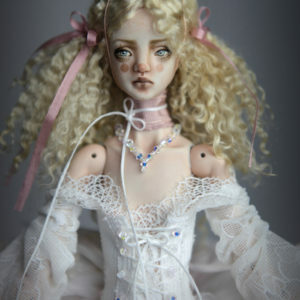 Has been listed on eBay as a 5 day auction that ends Sunday night. Combination of industrial carbon steel springs and elastics mechanism. Hand painted purple eyes and hand painted face features detailed down to individual eyelashes and eyebrows. Intricate engraved and painted tattoos inspired by spiritual elements Mandala, Amethyst Crystals, Wise Owl and Pisces. 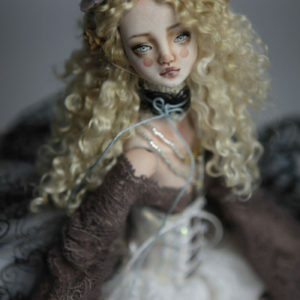 BJD Doll have a one of a kind premium soft removable brushed and styled mohair wig. Hand made crown made of a combination of brocade fabric, metal and hundreds of aurora borealis crystals. Removable three piece queen outfit made of purple, yellow and iridescent turquoise raw silk. Accented with sewn patterns in fuchsia metallic threads. Petticoat has a hidden magnet for easy attachment. Hand made removable shoes and undergarment are made of brocade fabric, yellow and iridescent turquoise raw silk, adorned with aurora borealis crystals and metallic gold buckle.